It is so "in" to have a bowl of cereal with milk in the morning. After all, all Hollywood movies show big stars waking up and pouring milk into a bowl of cereal as they kickstart their day. Yes, cereal is a very glamorous breakfast. Interestingly, it is also sold as the ultimate "healthy breakfast" option. It is supposed to give you nutrition, fibre, minerals & carbs, and without nasty oils and fats. But hey, how true are these claims? Eating a cereal based breakfast is a healthy concept. After all you do get a good punch of carbs, protein and fibre along with minerals and vitamins. But the packaged cereal sold commercially is usually no good. Almost all the cereal boxes you see in markets are loaded with sugar and fat. The sugar content is usualy so high that you'd be better off eating a paratha for breakfast. 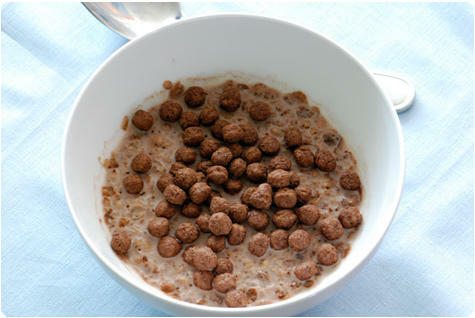 Add chocolate to the cereal and it gets worse. Sure, the cereal tastes good, but let's not fool ourselves about the "healthy" part. If you are really health-conscious, the Indian menu has a lot to offer. Here are a few healthy breakfast ideas that are way better than cereal and taste better too. If you eat one of these items on each day of the week, you can have the breakfast of your choice on the Sunday. Aaloo-puri or chana bhatura or your favorite aaloo parathas, whatever you desire! Worst Breakfast Items if you are trying to Lose Weight!!!! What Makes A Breakfast Healthy?